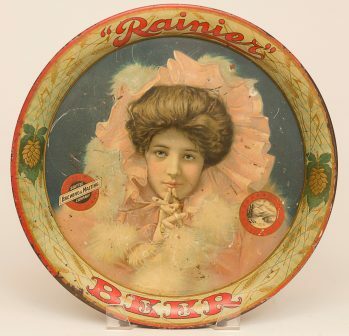 Scarce pre-pro tin litho advertising tray for Rainier Beer featuring Evelyn Nesbitt. The tray was distributed by Seattle Brewing and Malting Co. of Seattle, WA. Tray has many scratches and scuffs, as well as areas of litho loss on rim and in field.